Gorilla permit $1500 and Golden Monkeys permit $100 are additional. 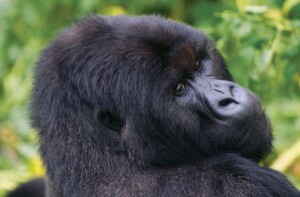 The ultimate wildlife adventure, Rwanda is THE place for viewing endangered mountain gorillas and the best way to do so is with Great Safaris Rwanda Gorilla Trekking. These gentle giants, which share 98% of our DNA, are found in Volcanoes National Park / Park National des Volcans (PNV), home to mountain gorilla, golden monkeys, spotted hyena, buffaloes, elephants , black-fronted duiker, and bushbuck; the park also harbors 178 bird species. The mountain gorillas are reached after a trek of three to eight hours up and through the rain forest. Participants should be in good health and able to sustain a slow climbing pace. The effort, however, earns amazing rewards! Great Safaris Rwanda Gorilla Trekking – 4 days extension includes: 3 nights accommodation, one gorilla trek, golden monkey excursion, all meals and transfers.